To read this newsletter in an easy-to-read pdf form, click here to download the newsletter Discovering Fresh Whey. Thank you. On a recent Saturday morning on Martha’s Vineyard, I sat with my nephew Doug Kenney at the Grey Barn farm stand as we waited for more eggs to be gathered. We had driven the five miles to Grey Barn Farm, owned by Molly and Eric Glascow, to buy “real” eggs from their barnyard hens. I often make this trip to get eggs from chickens that roam freely, foraging for foods that chickens love best—grubs, worms, insects, and grain. Chickens that forage in this traditional way are well-nourished. They lay eggs with deep-orange yolks and a perfect balance of omega-3/omega-6 essential fatty acids. As a year-round resident who buys locally grown food in every season, I could not do much to help with this first problem. But, my heart skipped a beat on the second: Because I use whey for making bread, soaking beans and grains, and as an addition to soups and stews, I thought I might be able to help create demand for his surplus supply of whey. Not only did I want to be a regular customer if Molly and Eric would begin bottling and selling their fresh whey, but I also wanted to help others learn to use whey in the kitchen because of its high-protein, enzyme, and nutritional profile and because of the way that it can facilitate cooking. Whey is not a whole food, but finding uses for whey supports sustainability. Ironically, for years, I have bought yogurt from organic dairies like Hawthorne Valley and Mermaid Farm (on Martha’s Vineyard) to make my own whey for cooking, while I give to friends the “surplus” by-product, a soft cream cheese. To find a potential source of fresh whey seemed too good to be true. Finding ways to use whey in the kitchen supports sustainability: Domestic cheese production has more than doubled in the last 35 years; and, because every pound of cheese leaves behind nine pounds of whey,1 whey has become a greater environmental issue. It can be harmful to ecosystems if dumped into rivers and streams. And, if it is spread on the same land area over time, a subsoil layer of fat can build up to prevent plants from growing.2 Thankfully, the food industry and medicine are finding more and more uses for whey as a high-protein additive to foods and nutritional supplements. Whey is not a whole food, but if we eat cheese, we can do our own part to consume whole milk in its separate parts…cheese and whey…by exploring adaptive ways to bring whey into our own home kitchen. utilized by the body.3 Whey is also the highest natural source of branched-chain amino acids—isoleucine, leucine, and valine—and a major source of glutamine. Both branched-chain amino acids and glutamine play a vital role in proper cell function, muscle growth, and protein utilization. Glutamine also feeds white blood cells throughout the body and the cells that line the intestines (a key center of immune health). Whey is used by medicine to inhibit tumor growth; repair both exercise-related and radiation-/chemotherapy-related tissue damage; improve muscle strength, while preventing muscles from atrophying after accident or illness; and to help the body to recover from trauma and surgery. As a sign of Nature’s gold seal endorsement of whey’s importance for human growth and vitality, whey accounts for 80% of the protein in human breast milk. This is not the case for cow’s milk, where whey makes up for only 20% of the protein content. Casein, the milk protein that is high in calcium and phosphorus and curdles to form cheese, accounts for the other 80% protein component of cow’s milk. Cow’s milk appears to be formulated to quickly build calves into cows. Nature seems to have designed breast milk with a more sophisticated eye to immune health, cellular function, and survival. Whey contains enzymes, calcium, potassium, phosphorus, iron-bonding proteins, vitamins A, C, B1, B2, B3, B5, B12, folic acid and biotin. Fresh whey is about 95% water, 4% lactose, 1% protein, 1% ash, and less than 1% fat.4 Given the high water content of fresh whey, it is easy to see that whey powder (unless the lactose is removed in processing) is largely lactose, which is a form of sugar. Food companies often use commercial whey powder to help sweeten “sugar-free” products. Whey can be used as a partial substitute in many recipes that call for water. Fresh whey contains lactic acid, which helps breakdown foods to make them easier to assimilate and works as a preservative to extend the shelf life of foods. Whey added to soups, stews, and marinades adds a richer flavor, while it enhances protein and general nutrition. It also works to tenderize meats when added to marinades, and a small amount can improve the texture of bakery products. Whey can also be consumed as a stand-alone drink, served either hot or cold. Using it in smoothies and fruit and vegetable drinks that are not heated preserves its enzymes, which are heat-sensitive and are lost in cooking. Since I cannot yet buy whey in volume and must make my own from yogurt, I use it sparingly. So, of all the possible uses in the kitchen, I most often use whey as a soaking agent for beans and grains to reduce phytic acid, an enzyme inhibitor and nutrient blocker. Adding a tablespoon or two of whey to the soaking water of beans and grains can reduce cooking time and improve digestibility. 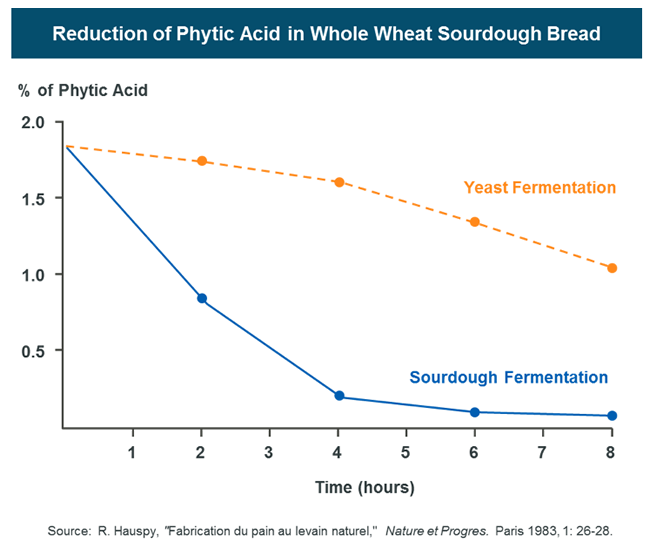 Because, like whey, sourdough contains lactic acid, we might think of sourdough as a proxy for what lactic acid can do to diminish phytic acid in grains and other seed-type foods. Counter-top soaking for a period of 12-24 hours can dramatically reduce phytic acid, as illustrated below. Soaking grains in water and whey, or any acid for that matter, degrades phytic acid (a good thing), while it also makes grains more digestible (both good and bad). When grains are digested and assimilated rapidly, they can cause blood sugar to spike, a factor that with time is linked to insulin resistance, diabetes, and obesity. Eaten alone, acid-soaked whole grains can cause even greater spikes in blood sugar than refined grains! But this is easily resolved by adding a protein or a fat like butter easily dampens this blood sugar effect. Adding a pat of butter to grains that have been soaked in whey not only dramatically reduces the blood sugar spike, but it also helps the body absorb the minerals in the grain, since the body requires fat to assimilate minerals. Whey in baking. When used in bread dough, whey adds nutrition, renders a crispy browned crust, and retards spoilage. Whey can be substituted for up to one-third of the water called for in a recipe. Adding some whey improves the rise of bread dough, especially in winter. While I have not tried it myself, whey can also be substituted for water when mixing batter for pancakes, muffins, and scones. Remember that substituting whey for water can affect the leavening. If a recipe calls for baking soda, no adjustment is needed; however, if a recipe includes baking powder, add ½ teaspoon of baking soda as a neutralizer for every one cup of whey that you use. But not everyone agrees that whey should be used to ferment. Sandor Katz as well as Kelsy of The Liberated Kitchen use only salt in fermenting fruits and vegetables. Their logic is that milk bacteria thrive on lactose, and since milk bacteria are not the same type of bacteria that reside in the soil and thrive on plants, bacteria from cultured milk play no logical role in the fermentation of vegetables. I appreciate both views. If you ferment, you can see which method gives you a better product. There are several advantages to adding whey—it enhances the nutritional value of a ferment; it accelerates fermentation and acts as a preservative, so you may need less salt when fermenting; and it adds an extra complement of healthy bacteria to support the good bacteria/microbial environment in the body. Whey in place of water in smoothies, soups, stews,casseroles, and gravy stocks. As mentioned earlier, whey can be consumed as a stand-alone drink, served hot or cold, but using it in cold drinks is preferred. The reason is that heating whey destroys the good bacteria and enzymes, so some of the better kitchen applications are choices that do not involve heat. In the warm summer months, blender-made smoothies and cooling summer soups are a perfect way to use whey. Whey goes particularly well with citrus fruits and apple cider, as well as juiced fruits/berries, carrots, celery, and tomatoes. Experiment with a high-powered blender and your own favorites on a hot summer day. As noted earlier, since fresh whey has no carbohydrates to speak of, its low-glycemic effect can help blunt the blood sugar impact of fruit drinks. You can also use whey in soups, stews, casseroles and gravies for a richer, fuller flavor, while adding protein, vitamins, and minerals. Heating, of course, will destroy the healthy bacteria and enzymes. Try to use a good traditional (not thick Greek style) yogurt made from the milk of grass-fed cows. Mermaid Farm and Hawthorne Valley are examples that I am able to purchase on Martha’s Vineyard. Line a colander or large strainer with strong cheese cloth, placing the strainer over a bowl just large enough to hold the strainer. Stir the yogurt and gently pour it into the cheese cloth. Allow the yogurt to sit for about 8 hours, which will produce about one pint of whey and 2 cups of soft cheese. The cheese can be spread on bread or used to make cheese cake. Whey keeps about six months in the refrigerator; the soft cheese, for about a week. Whey is the watery residual left in cheese making when milk curdles, forming curds of cheese. Whey is high in easy-to-assimilate proteins, as well as lactose, enzymes, and minerals. Whey contains Lactobacilli, the primary bacteria that transform lactose into lactic acid. Lactic acid is the major acid created in fermentation. The bacteria in milk digest lactose, breaking it down to lactic acid. As lactic acid builds up, it works to prevent the growth of harmful bacteria. Phytic Acid (phytate) is a nutrient/enzyme inhibitor. Phytic acid is concentrated in the bran portion of grains where it binds phosphorus. Phytic acid in the form of phytate blocks the body’s ability to absorb calcium, magnesium, iron, and zinc, as well as the digestive enzymes pepsin and amylase. Sourdough is a natural leavening agent created when wild bacteria and yeasts circulating in warm air begin to feed on flour when it is mixed with water. Sourdough acts to preserve baked goods, while it also reduces phytic acid and enhances the nutritional quality and assimilation of baked products. Nancy Lee Bentley, Truly Cultured; Sandor Katz, Wild Fermentation; Sally Fallon, Nourishing Traditions. Sally Fallon, Nourishing Traditions, Washinton, D.C., New Trends Publishing, Inc., 2001, p. 29. Jay R. Hoffman, “Protein—Which is Best?” Journal of Sports Science and Medicine; 3(3): 118-30. Opinion in Clinical Nutrition and Metabolic Care 2005; 5 (1): 69-75. E. Annie Proulx and Lew Nichols, The Complete Dairy Foods Cookbook. Joseph E. Pizzorno Jr. and Michael T. Murray, Textbook of Natural Medicine, pp. 681-84. N. Rukma Reddy and Shridha K. Sathe, Food Phytates. The first recipes below are taken from The Complete Dairy Foods Cookbook by Annie Proulx and Lew Nichols. Afterward, I have included smoothie recipes that incorporate whey. These are perfect for a hot summer day when fresh fruits and vegetables are plentiful. I have adapted the smoothie recipes from www.smoothiesweb.com and they are marked with an asterisk. May these recipes give you ideas for incorporating whey into your own favorite recipes. 2. Melt the butter in a saucepan, then cook the cucumbers over low heat, 10 minutes. 3. Blend in the flour; then gradually add the whey, stirring constantly. 4. In a separate saucepan, scald the milk with the onion slices, then strain the milk into the cucumber mixture, stirring constantly. Simmer 10 minutes. 5. Puree the soup in a blender; cup by cup, and stir in the cream. Chill several hours in the refrigerator before serving. 1. Cook the snow peas in a steamer over boiling water until just tender. Set aside. 2. In a heavy pan, put the watercress, whey and shallots and simmer 15 minutes. 3. Puree the watercress stock in a blender until smooth, then return to the pan. Add the snow peas and heat slowly. Do not boil. 4. Mix 2 or 3 tablespoons into the yogurt, then stir the yogurt into the soup. Serve at once, garnishing each bowl with the chopped chives and a spring of watercress. 1. Simmer the carrots and potatoes in the whey until tender. 2. Melt the butter in a skillet and sauté the shallots, garlic and almonds for 5 minutes. 3. In a blender, puree the shallot-garlic mixture, cup by cup with the carrot-potato mixture. Return to the saucepan where the carrots and potatoes were simmered. 4. Blend in the buttermilk and heat thoroughly until hot. Stir in the horseradish and ginger root. Serve at once. 2. Slowly beat in the olive oil, lime juice, whey and yogurt. 4. Just before serving saute the bread cubes in the butter in a heavy skillet until they are brown and crisp and sizzling hot. Ladle the cold soup into chilled bowls and top with the hot croutons. 1. In a blender, combine the almonds, honey and whey. Blend until smooth, then strain, getting as much liquid as possible. 2. Add the milk and chill thoroughly. Stir well before serving. Put all the ingredients in a blender and blend until thick. Put the carrot, honey and whey into a blender and blend until smooth; then briefly blend in the yogurt. Strawberry Smoothie* (serves one)…A Basic Guide for Creating Other Fresh Fruit Smoothies. 2. Pour in the honey, blend, and then add the ice cubes. 3. Blend on low and gradually move to high until everything is a red fruity liquid. 4. Then blend for another 30 seconds to aerate. 5. Pour into a glass and enjoy. Combine apple juice, carrots, applesauce, gingerroot and cinnamon and blend from low to high until creamy. Season with salt and cayenne pepper to taste.